This is to confirm that the University remains open. Registration continues. However, due to the industrial strike action it has been crucial to adjust our earlier communicated commencement of the academic programme. 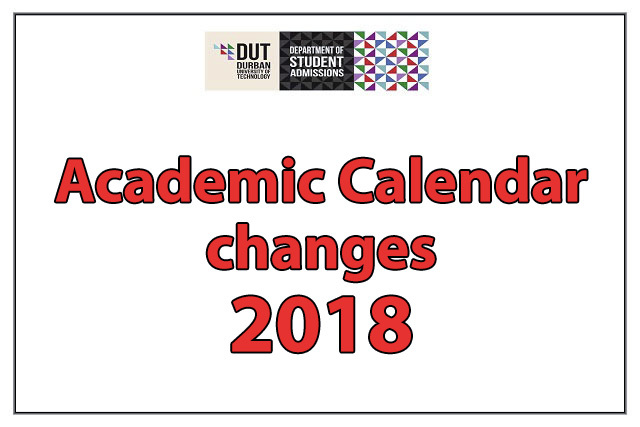 The academic calendar will commence on Tuesday, 13 February 2018. Students can also register in person; on campus, in Durban or Riverside campus, in the Midlands Campus. Students who require further assistance or have any questions regarding the admission process can contact: 031 373 5005. The DUT Management would like to assure all its stakeholders that they will continue to work towards ensuring that the functions and work of the University continues and that the safety and protection of students, staff and University property remain a priority. The DUT Management wishes to express its sincere apologies for any inconvenience caused and appreciates the aptience that has been demonstrated by all DUT stakeholders to date.